insects or plants are place for observation. 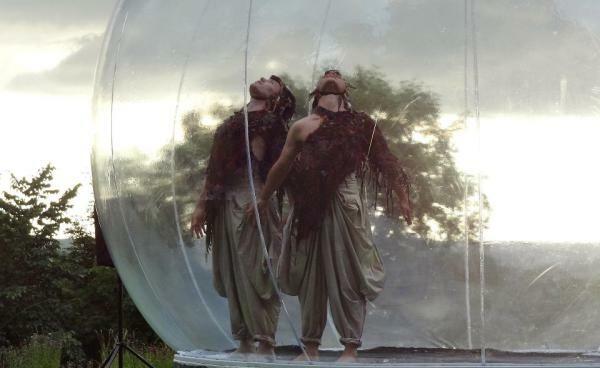 Terrarium is a 30-minute long dance duet performed inside a 4.5metre diameter transparent globe. The dancers are like specimens contained in their own microcosm; they evolve, flourish and wane like strange creatures or plants. Visually rich and choreographically intricate, this work closely fuses set and costume design with movement and is a response to the ideas of metamorphosis and transformation. Terrarium appeals to all ages and has been described as ‘beautiful and mesmerising’ and ‘a feast of sight and sound’. A 30-metre diameter circle of ambisonic speakers surrounds the audience, so while they watch the action performed inside the globe they are themselves enveloped by a bubble of music and sound. The set and costumes for Terrarium 2019 will be designed by Myriddin Pharo, with lighting designed by Joshua Pharo.